Many Irishmen are serving in the British armed forces, fighting and dying on the Western Front and further afield. Ireland itself has been spared the destruction war has brought to Europe. That may be about to change. Before war came to Europe in 1914 Ireland stood at the brink of civil war. The country was divided between supporters and opponents of the Home Rule that the British government had agreed to grant the island. 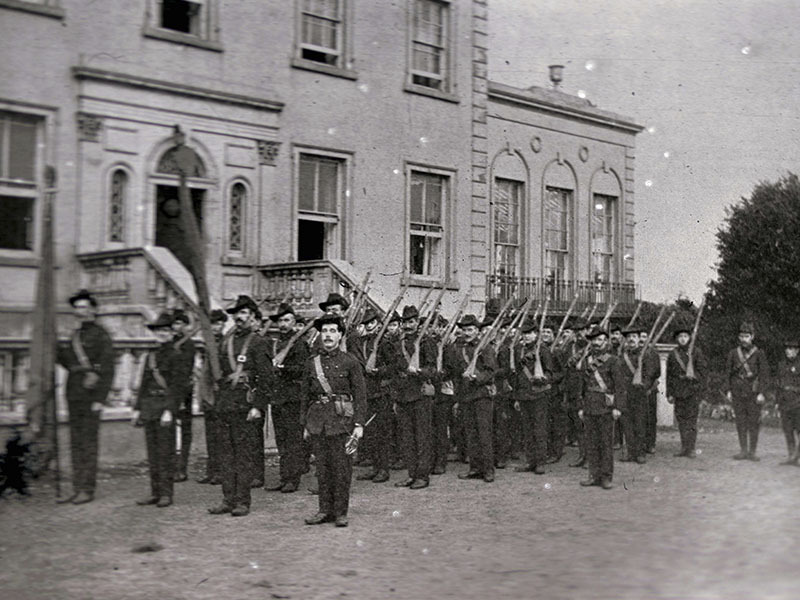 In the north east of the island the Ulster Volunteers had formed to oppose Home Rule while throughout the country the Irish Volunteers formed to defend its introduction. Both of these militias imported arms from Germany and prepared to fight. The outbreak of war in Europe allowed the British government to suspend Home Rule for the war’s duration. The Irish Volunteers split into pro- and anti- war factions. The larger National Volunteers supported the British war effort. 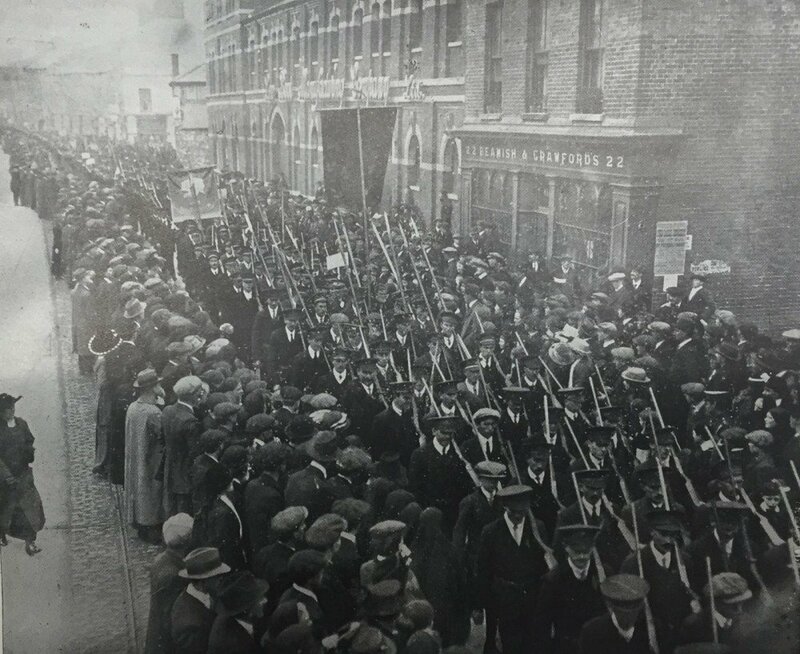 Many of them heeded the call to join the British army of Irish Parliamentary Party leader John Redmond. As time went on the remaining National Volunteer organisation became largely moribund. The smaller anti-war faction kept the name Irish Volunteers and has remained active. Many of their leading officers are covert members of the Irish Republican Brotherhood, a secret society intent on making Ireland fully independent of Britain. The IRB’s Military Council has decided to stage an uprising against Britain, using the men of the Irish Volunteers to do so. Although the Volunteers’ leader, Eoin MacNeill, is not a member of the IRB, the Military Council hope to secure his support for the rising by using forgeries of British documents to make him think that the suppression of the Volunteers is imminent. The IRB have also formed an alliance with the Irish Citizen Army, a small socialist militia, whose leader James Connolly has been sworn into the IRB. He agrees that the Irish Citizen Army will join the rising. The rising is to begin on Easter Sunday, the 23rd of April. For the rebels, taking on the might of the British Empire will be a bold step. They are hoping for a further shipment of arms from Germany, but the IRB leadership must know that they have little chance of victory. In the morning Lichnowsky and Grey meet once more. To win British neutrality, the German ambassador says that Germany will not send its fleet to attack the French coast. Germany will also restore Belgium to its full sovereignty after the war. Grey makes no promises. It is a bank holiday Monday, yet the cabinet is meeting again. The House of Commons will also be sitting in the afternoon. Germany’s ultimatum to Belgium has won most of the cabinet to war, though some ministers are opposed to war in any circumstances and tender their resignations. In the afternoon Grey addresses the House of Commons. In a long and boring introduction he rambles on about how the crisis has developed and reveals that Britain has agreed to defend France’s coast from the Germans. But after an hour he hits his stride and makes an impassioned plea for his country to come to the defence of plucky Belgium. This provides the perfect mix of national interest (preventing German access to the Belgian coast) and lofty idealism. The foreign secretary finishes to thunderous applause. Two of the anti-interventionist ministers are won over, withdrawing their resignations. But support is not unanimous. The Labour Party rejects involvement in the war, as do a small bloc of Liberals. And Lichnowsky wires home that the speech still leaves room for negotiation; he suggests that the British leadership are not completely behind war. 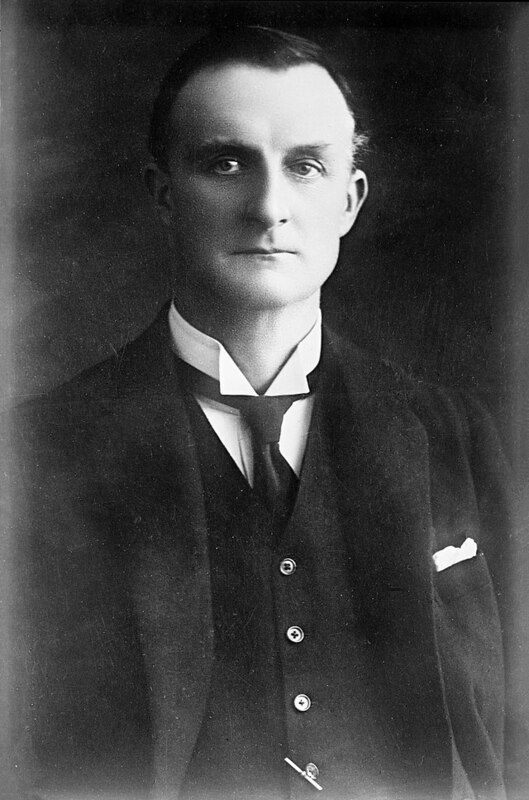 Other speakers in the House of Commons include John Redmond, leader of the Irish Parliamentary Party. He proposes that Britain withdraw its forces from Ireland, as the Irish Volunteers and Ulster Volunteers will jointly defend it. These two militias had been on the brink of fighting each other over the Home Rule question. The Cabinet meets again in the evening. Grey sends a note of protest to Germany regarding Belgium, though not an ultimatum.